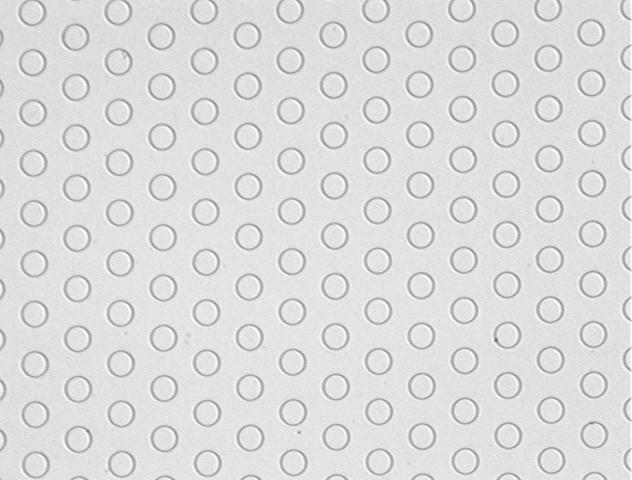 Ø Microdisc Electrode Arrays (MDEAs) are inert, array microelectrodes formed from a microlithographically patterned insulator-on-conductor-on-insulator configuration. They are designed for the study of electrochemical and optical properties of thin polymeric films and coatings, for applications in microelectrochemistry, for electrical/electrochemical impedance spectroscopy, and for chemical and biological sensor development. 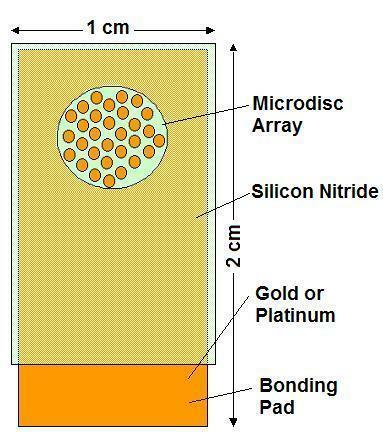 Ø Microfabricated from 100 nm magnetron sputter-deposited gold, e-gun vapor-deposited platinum, or conductive indium tin oxide (ITO) on an electronics grade borosilicate glass, these devices are supplied in three microdisc diameters and corresponding microdisc densities. A 500nm thin silicon nitride layer is applied over the conductor and is microlithographically windowed using reactive ion etching to reveal an array of micro-windows to the metal beneath and a bonding pad. MDEAs are avalable as packaged (with attached leadwires and encapsulated) or as un-packaged die. Ø MDEA chips of gold, platinum, or ITO are available with 50 microns, 100 microns, 250 microns, or 3,600 microns disc diameter. 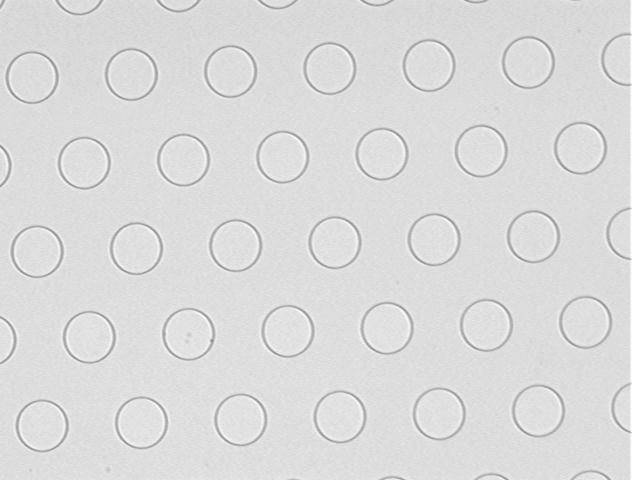 Ø Investigate the chemoresistive responses of transducer-active, polymeric thin films in the same electrode configuration, the same test environment, and on the same sample film. Develop these devices into products where the application requires a compact, durable and versatile chemical or biological chemoresistive or electroanalytical sensor of low cost. 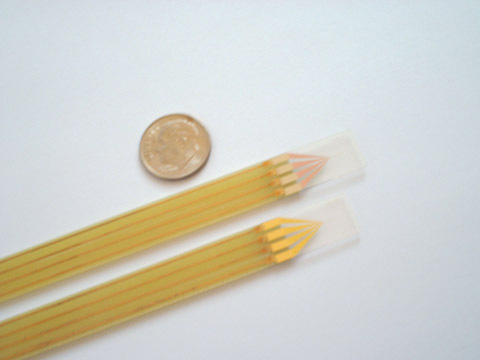 Ø As conductimetric chemical sensors and biosensors based on electroactive polymers. Such devices exploit the very large change in electrical impedance that accompanies oxidation/reduction of these polymer films. Films are conferred with chemical and biological specificity through the use of inorganic catalysts, organic hosts-guests binding compounds, synthetic antibodies, or molecularly imprionted polymers, and natural biorecognition agents such as enzymes, antibodies and DNA. A single disc, 3.60 mm in diameter. 207 separate discs, each 250 mm in diameter and arranged 500 mm on centers in a hexagonal close packaed array. 1,296 separate discs, each 100 mm in diameter and arranged 200 mm on centers in a hexagonal close packaed array. 5,184 separate discs, each 50 mm in diameter and arranged 100 mm on centers in a hexagonal close packaed array. Epoxy header. Polyimide packaged chip. 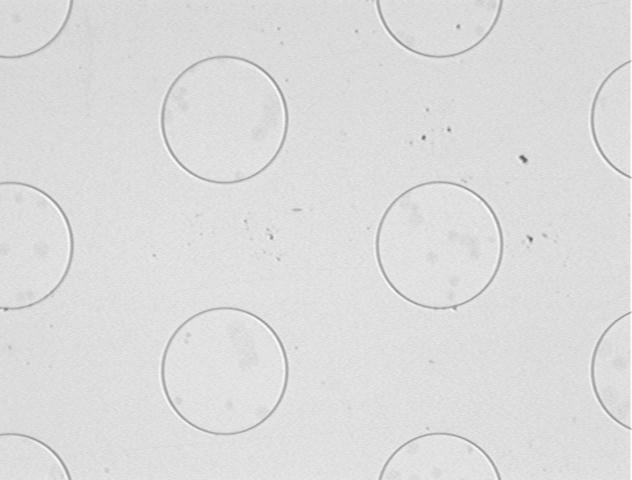 Ø Films or coatings may be applied to the MDEA device by dip coating, spin casting, spray painting, air-brushing, brush painting, by Langmuir-Blodgett thin film deposition technique, by electropolymerization, and/or by molecular self assembly. 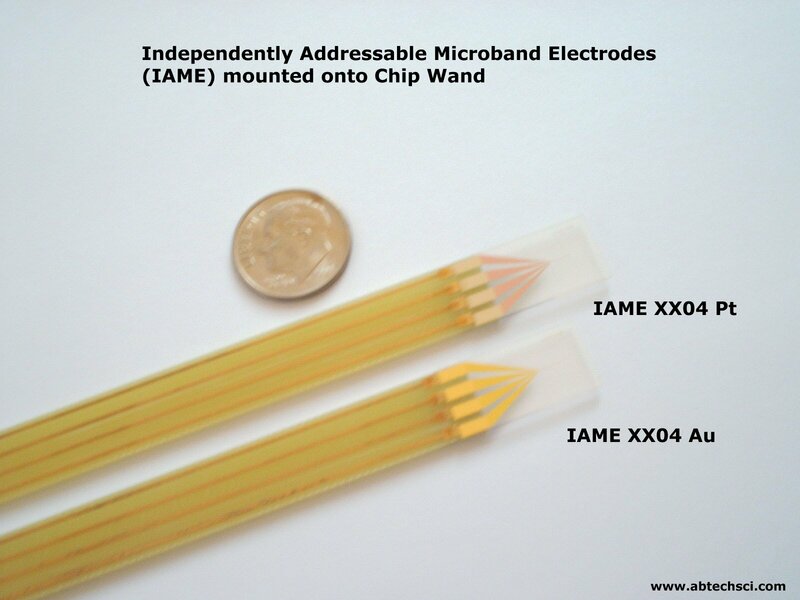 Ø Electrical contact is made via bonding pad loacaed on on end of the chip. 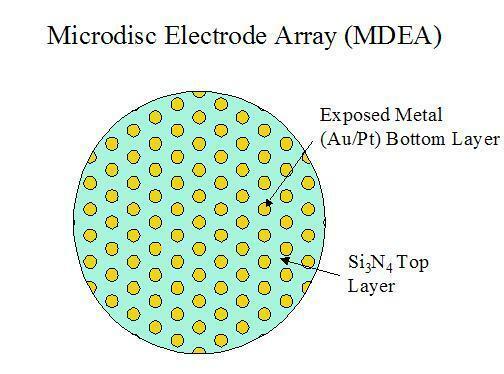 Microdisc Electrode Array (MDEATM) is the tradename for a family of devices developed by ABTECH. 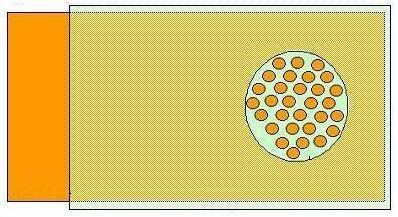 Also called microelectrode arrays, these devices are microfabricated (using microelectronics fabrication techniques) to form patterns of conductors deposited on an insulating substrate chip.